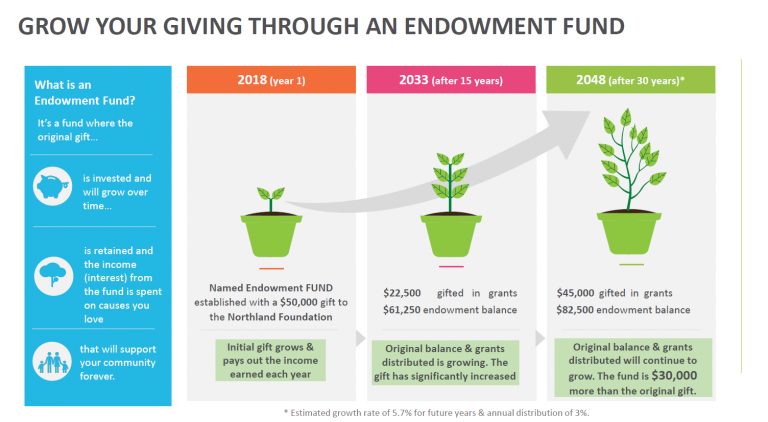 You gift a capital sum to the Northland Community Foundation in your Will for a particular cause/fund and these funds can be invested or distributed directly out. 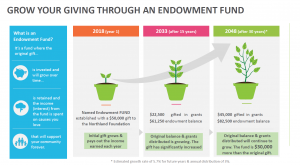 You gift a capital sum to the Northland Community Foundation in your Will so that the funds can be invested or given directly out to your particular cause or fund you are interested in. Invested funds create a legacy for the donor and earn interest every year that can be distributed to the chosen charitable cause forever! Your wishes as the donor will be honoured by the Foundation and we will communicate with your family to let them know annually how your gift has been used for the benefit of Northland. Donations during your lifetime give you the benefit of seeing your gift at work and will qualify for a 33.3% tax credit. You can choose to invest these funds or deliver them out directly. The choice is yours. Donations during your lifetime give you the benefit of seeing your gift at work and will qualify for a 33.3% tax credit. You can choose to invest these funds and deliver the interest out every year for the particular cause you are interested in. Or you can donate directly to a fund or cause of your choice. In either case, we will let you know every year how your gift has been used for the benefit of Northland. If you have a charitable trust – or you are thinking about setting one up – talk to us about how we can help with compliance requirements, future trustee succession planning and asset transfers. It can be an expensive and time-consuming process to set up a charitable trust. Northland Community Foundation is already set up and functioning to take care of all the requirements. You can concentrate on other things while we work for you. For all types of giving we encourage donors setting up their fund to make a one-off donation of $5000 which goes towards the operating expenses of the Northland Community Foundation allowing us to continue the daily work of the Foundation. The donation will qualify for a 33.3% tax credit. You can donate to any of the Foundation funds and choose for the funds to be invested or donated directly out to the particular service you are interested in. You can make your selected donation each payday and the qualifying tax credit is given at the time of the donation – not at the end of the tax year. It’s just so easy. Talk to your payroll team to get set up. Or have a chat with us to get started. A way for a group of friends to pool financial resources and target your giving to a common interest or charity. You have the enjoyment of time spent with like-minded friends or colleagues – and you can make a real difference to the community you live in. We will let you know each year, how your fund is growing – and once it reaches a level where distributions can be made, we’ll let you know each year how your gift has been used to improve Northland. Your gift to the Community Fund will help to support and strengthen Northland and Northlanders. Your donations can be pooled and invested or donated directly out, it’s your choice. Interest from the invested funds and direct donations will be delivered to organisations who are supporting the Northland community, in the form of grants. A donation to the Community Fund allows our grants panel to use their knowledge of the Northland community to target the income from your donation to wherever the need is greatest at the time. Once per year, applications are accepted from community groups. The grants panel considers each application and delivers the funds where they will have the most benefit. You can gift directly to the Community Fund so your gift can be used now by the service of your choice and you receive a 33% tax credit. Visit our donate page here https://northlandcommunityfoundation.org.nz/donate/ to donate by credit card or through your bank account. You will need to choose Community Fund. The Community Fund is kindly supported by The Tindall Foundation in the form of a sub-fund called the Grassroots Fund. 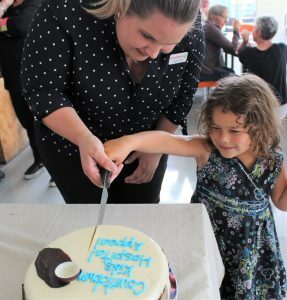 Northland Community Foundation is proud to be a regional funding manager for The Tindall Foundation in the Northland region for the programme area of ‘Supporting Families and Social Services’. By contributing to this fund, you will enable us to support more of the excellent projects that are proposed by and for our local communities. 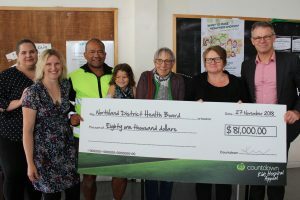 The Grassroots Fund provides grants of between $1,000 and $15,000 for initiatives that aim to improve the lives of Northland people in the long-term. The grants panel receives applications once per year and prioritises applications from small organisations run mostly by volunteers in the local community. In recent years, the Grassroots fund has supported organisations such as Dargaville Early Years Hub, who support the whānau of vulnerable tamariki up to six years old by providing a child-friendly drop-in centre and improving access to much-needed services to improve health and education outcomes of the youngest members of our community. You can gift directly to the Grassroots Fund and you receive a 33% tax credit. Visit our donate page here https://northlandcommunityfoundation.org.nz/donate/ to donate by credit card or through your bank account. You will need to choose the Grassroots Fund. Volunteering Northland is one of the organisations that is doing great work in the Northland community, matching people with a little time to spare with organisations in need of a helping hand. Northland Community Foundation has established an endowment fund on behalf of Volunteering Northland, which you can choose to donate to directly. • Volunteering Northland is a non-profit organisation providing a recruitment and referral service for volunteers and facilitates and enhances volunteering in general. • Local organisations and organisers of one-off community events that employ volunteers sign up at the volunteer centre and list their available opportunities for volunteers. • The opportunities are accessible on-line, at the centre, advertised in local media and promoted at public events. The volunteer centre matches potential volunteers with opportunities. • The centre provides more opportunities for youth, migrants and others who are looking to find their place in the community. • The volunteer centre supports and provides training for the volunteer coordinators, raising the level of professionalism. • The centre provides advice, advocacy and recognition for the volunteer. You can gift directly to Volunteering Northland so your gift can be used now by the service and you receive a 33% tax credit. Visit our donate page here https://northlandcommunityfoundation.org.nz/donate/ to donate by credit card or through your bank account. You will need to choose Volunteering Northland on the drop down menu of funds. with the Charities Commission: CC48740. Funds totalling $100,000 from Mr Reed’s estate have been invested, developed and grown since 2005 which enables interest to be released as scholarships every three years. The total balance of the fund has now increased from its original value by over 50% to $158,680 under the management of Craigs Investment Partners. Otangarei 12 year old Teru Carrington-Bartlett has been awarded the 2018 scholarship, valued at $10,000. The scholarship earns Teru five years of boarding school at Epsom Girls Grammar School where she will commence year 9 in 2019. Teru was one of the stars of the December 13 prizegiving at Te Kura o Otangarei / Otangarei Primary School. On top of the high school scholarship, Teru was named I Have a Dream Foundation Dreamer of the Year, and received awards for Exceptional Qualities in Te Reo Maori me nga Tikanga, the Year 8 Academic Award and another award for contributions to music and dance. Now donors can provide the ultimate gift – a donation or legacy in their Will to Northland. In partnership with Northland Community Foundation, people are encouraged to consider a gift which will go on forever. Bequests (a gift through a Will) and donations can be invested for perpetuity and the interest distributed every year to the charitable cause they are interested in. The Northland "I Have a Dream" Fund is part of the "I Have a Dream Foundation" programme which operates in the Otangarei/ Tikipunga/ Totara schools, and called the Ngatahi Education Initiative. The Initiative pairs volunteer ‘navigators’ with students to follow the children through primary, secondary and tertiary education. They provide consistent academic oversight, advocacy and support. Navigators have a formal relationship with the school, engage with the children’s families and communities, and provide services for the kids that give them the life skills and academic support they need to succeed. You can gift directly to I Have a Dream Fund so your gift can be used now by the service and you receive a 33% tax credit. Visit our donate page here https://northlandcommunityfoundation.org.nz/donate/ to donate by credit card or through your bank account. You will need to choose the I Have a Dream Fund on the drop down menu of funds. We live in one of the most beautiful and environmentally diverse regions of New Zealand. Our coastline is spectacular and our podocarp forests are remarkable. But maintaining our environmental heritage for the future is not a simple process. Many groups and organisations spend countless volunteer hours carefully making sure that what we have now will be sustained and even improved for those who come after us. You can gift directly to the Environment Fund so your gift can be used now and you receive a 33% tax credit. Visit our donate page here https://northlandcommunityfoundation.org.nz/donate/ to donate by credit card or through your bank account. You will need to choose the Environment Fund on the drop down menu of funds. The Northland-based Mountains to Sea Conservation Trust (CC23406) was established in 2002, as a charitable umbrella and support organisation for the Experiencing Marine Reserves (EMR) marine education and Whitebait Connection (WBC) freshwater education programmes. These are both leading models in education for sustainability in Aotearoa/New Zealand. The Trust sees education as a vital part of society and central to all environmental restoration. Both programmes involve young people, their parents and the wider community. The programmes reinforce simple concepts such as the uniqueness of our freshwater and marine biodiversity and provide an active focus on conservation of these environments through education and action. The goal is to empower and support communities to achieve marine and freshwater conservation through science based experiential programmes, resources, projects and community engagement. The programmes focus on schools as a focal point for communities to come together and see the future of marine and freshwater through the eyes of their children, thereby motivating meaningful learning and long-term behaviour change in both today’s and tomorrow’s generations. You can gift directly to Mountains to Sea Conservation Trust so your gift can be used now by the service and you receive a 33% tax credit. Visit our donate page here https://northlandcommunityfoundation.org.nz/donate/ to donate by credit card or through your bank account. You will need to choose the Mountains to Sea Fund on the drop down menu of funds. The Puketi Forest Endowment Fund has been set up under the umbrella of Northland Foundation, for the maintenance and restoration of Puketi Forest. Puketi Forest Trust, through its project ‘Oh Mai Puketi’ (Awaken Puketi), is working to restore and protect Puketi Forest, an ancient kauri forest located near Kerikeri. The Forest contains magnificent stands of kauri, podocarp and hardwood trees and a rich ecological diversity including 370 recorded species of plants, some of which are found nowhere else in the world. A comprehensive trapping network for pest control has been established over 5,500 hectares and significant progress has already been made to improve the health of the forest. This has enabled the return of abundant birdlife and re-introduction of North Island Robin and Kokako. Further re-introductions are planned. You can gift directly to Puketi Forest Trust so your gift can be used now by the service and you receive a 33% tax credit. Visit our donate page here https://northlandcommunityfoundation.org.nz/donate/ to donate by credit card or through your bank account. You will need to choose the Puketi Forest Trust on the drop down menu of funds. A new building, expanding and improving the original hospital, was opened on 28th September. The new building provides an accident and medical department, radiology and a 20-bed medical ward. Made in Kaiwaka, the Romeo Recliners feature premium lumbar support and the correct seat height and depth to provide the ultimate in comfort to our families. “Whānau who are caring for their loved one often stay overnight or spend quite a lot of time at the bedside,” offered Jen Thomas, operations manager, Bay of Islands Hospital. You can gift directly to the Health Fund PLUS – Bay of Islands Hospital so your gift can be used now by the service and you receive a 33% tax credit. Visit our donate page here https://northlandcommunityfoundation.org.nz/donate/ to donate by credit card or through your bank account. You will need to choose Health Fund Plus and then write ‘Bay of Islands Hospital’ in the comments. Or we can invest your gift and deliver the interest from these funds back to Health Fund PLUS – Bay of Islands Hospital every year, forever! You can gift directly to the Health Fund PLUS – Child Health Fund so your gift can be used now by the service and you receive a 33% tax credit. Visit our donate page here https://northlandcommunityfoundation.org.nz/donate/ to donate by credit card or through your bank account. You will need to choose Health Fund PLUS and then write ‘Child Health Fund’ in the comments. Or we can invest your gift and deliver the interest from these funds back to Health Fund Plus – Child Health Fund every year, forever! Nationwide, communities supported Countdown to raise $1.2 million from August until the end of October. The Northland community appeal raised $81,000 and staff from Countdown Okara presented Northland DHB Child Health Services with a cheque in November. Four year-old Whaiawa Tito, like her dad Pat, has Type 1 diabetes. There is no cure for Type 1 diabetes, and it requires constant careful self-management and good medical care. Whaiawa is the Northland face of the 2018 Countdown Kids Hospital Appeal. Each year, a group of staff at Countdown Okara in Whangārei use their own money to buy items for the Baton’s Up competition they organise as part of the annual Countdown Kids Hospital Appeal. This year the team managed to hit the target well before the three-month appeal was up. Countdown Group Manager for the Upper Northland Region, Madison Taylor said that the Okara store had to source raffle books from other stores to keep up with demand. The face of the Northland 2018 Countdown Kids Hospital Appeal, Whaiawa Tito and whānau attended the celebration. Whaiawa lives with type 1 diabetes and her parent’s Lisa and Patrick Tito pay for her to use a Freestyle Libre Blood Sugar Sensor to monitor and control her condition. Patrick also has type 1 diabetes and is aware that he is a role model for his daughter in how he manages his diabetes on a daily basis. He said it is neat to see Countdown and the community coming together to help Whaiawa and other kids by supporting this appeal. The $81,000 raised this year will go towards buying a stock of blood sugar sensors to loan out to parents who can’t afford the device. The sensor gives parents and children a break from the daily finger pricks required to monitor insulin levels and enables them to do a period of intensive sugar monitoring to try to improve their diabetes control. Northland DHB Chief Executive Dr Nick Chamberlain said it is amazing to have received almost $800,000 over the last 11 years from the Appeal. “I’m blown away, they’ve delivered more than we expected. You can gift directly to the Health Fund PLUS – Diabetes Services Northland so your gift can be used now by the service and you receive a 33% tax credit. Visit our donate page here https://northlandcommunityfoundation.org.nz/donate/ to donate by credit card or through your bank account. You will need to choose Health Fund PLUS and then write ‘Diabetes Services Northland’ in the comments. Or we can invest your gift and deliver the interest from these funds back to Health Fund PLUS – Diabetes Services Northland every year, forever! Whangarei's emergency department is open 24 hours a day, 7 days a week, providing the diagnosis, management and treatment of acute and urgent illnesses and injuries that may be life-threatening and require immediate attention. You can gift directly to the Health Fund PLUS – Emergency Department so your gift can be used now by the service and you receive a 33% tax credit. Visit our donate page here https://northlandcommunityfoundation.org.nz/donate/ to donate by credit card or through your bank account. You will need to choose Health Fund PLUS and then write ‘Emergency Department’ in the comments. Or we can invest your gift and deliver the interest from these funds back to Health Fund PLUS – Emergency Department every year, forever! Northland Community Foundation was the force behind the original fundraising programme to build the Cancer Treatment Centre. “Project Promise” galvanised a region to raise $3m in 3 years to build this vital Centre for people in Northland dealing with Cancer. Project Promise touched the hearts of thousands of Northlanders who gave willingly and generously to support this new building and many people will benefit every year as a result. The large, light, airy facility with superb equipment and furniture has already made a difference to those people on their journey with Cancer. You might like to give to the established Cancer Treatment Centre to improve the facilities or to help get the “nice to have” things that make a patient’s life more comfortable. You can gift directly to the Health Fund PLUS – Cancer Treatment Centre so your gift can be used now by the service and you receive a 33% tax credit. Visit our donate page here https://northlandcommunityfoundation.org.nz/donate/ to donate by credit card or through your bank account. You will need to choose Health Fund PLUS and then write ‘Cancer Treatment Centre’ in the comments. Or we can invest your gift and deliver the interest from these funds back to Health Fund Plus – Cancer Treatment Centre every year, forever! The “Brick Wall” inside the Jim Carney Cancer Treatment Centre was part of the “Project Promise” fundraising programme. More than 400 bricks were sold during the campaign. Now that the Centre is built, bricks are still available for purchase for $1,000 to support the ongoing work of the Centre. You will see that every brick has a message on it. You can choose your own message (up to 40 characters) so that “your” brick is special and personalised. The gift of a brick is greatly valued by the team at the Cancer Treatment Centre as it is a visual reminder of the people who have supported their work, as well as a reminder of the funds that have been raised. You can ‘Buy a Brick’ through our website: https://northlandcommunityfoundation.org.nz/donate/ via internet banking or credit card. Fill out the donation form, select Health Plus Fund, state that the donation is for the Cancer Treatment Centre, ‘Buy a Brick’ and write the message that you would like on the ‘Brick’. If you have any further queries about funding please do not hesitate to contact the Foundation on: 021 558 224 or 0204 139 8518. If you would like to get hold of the Cancer Treatment Centre call: 09 470 3261 or 0800 466 265 (0800 4oncology). Kaitaia Hospital is Northland District Health Board’s northernmost hospital. It is a general hospital serving a widely scattered population. The 26 bed hospital has a general ward, maternity and paediatric ward with all the supporting services, and also provides a substantial community health service. You can gift directly to the Health Fund PLUS – Kaitaia Hospital so your gift can be used now by the service and you receive a 33% tax credit. Visit our donate page here https://northlandcommunityfoundation.org.nz/donate/ to donate by credit card or through your bank account. 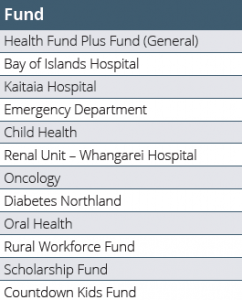 You will need to choose Health Fund PLUS and then write ‘Kaitaia Hospital’ in the comments. Or we can invest your gift and deliver the interest from these funds back to Health Fund Plus – Kaitaia Hospital every year, forever! Recent projects paid for by this fund include the purchase of four televisions for the community dental service, to ease the anxiety some patients feel when undergoing treatment, and to deliver positive oral health messages. You can gift directly to the Health Fund PLUS – Oral Health Service so your gift can be used now by the service and you receive a 33% tax credit. Visit our donate page here https://northlandcommunityfoundation.org.nz/donate/ to donate by credit card or through your bank account. You will need to choose Health Fund PLUS and then write ‘Oral Health Service’ in the comments. Or we can invest your gift and deliver the interest from these funds back to Health Fund PLUS – Oral Health Service every year, forever! Recently this fund paid for the rental of an exercise bike for the renal ward at Whangarei hospital. The exercise bike is helping to encourage a healthy lifestyle among renal patients and to reduce anxiety and the restless leg symptoms some patients experience when undergoing dialysis. You can gift directly to the Health Fund PLUS – Renal Department so your gift can be used now by the service and you receive a 33% tax credit. Visit our donate page here https://northlandcommunityfoundation.org.nz/donate/ to donate by credit card or through your bank account. You will need to choose Health Fund PLUS and then write ‘Renal Department’ in the comments. Or we can invest your gift and deliver the interest from these funds back to Health Fund PLUS – Renal Department every year, forever! 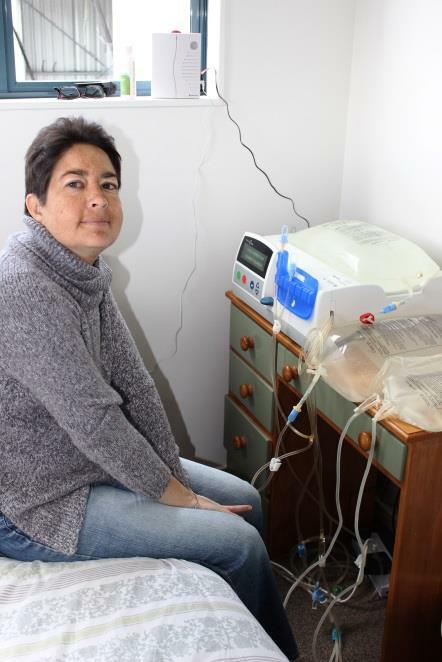 The Contact Energy Northland Renal Fund supports dialysis patients by funding applications of up to $1,000 towards items that would improve their quality of life on home dialysis. In 2009 Contact Energy and the Northland Community Foundation established the Contact Energy Northland Renal Endowment Fund. Contact Energy gifted $28,200 to “benefit low income residents of the Far North regions of New Zealand”, one of the most vulnerable communities, where the majority of the renal patients come from. The Northland Foundation manages the Fund on behalf of Northland DHB and after careful investment grew the fund to $38,000. In 2016 distributions began, and 24 grants were allocated to Northland dialysis patients needing support to improve their quality of life on home dialysis. Grants have now totalled approximately $24,000 and have been allocated for purposes ranging from a generator to prevent loss of dialysis during power cuts to recliner chairs and contributions to power bills, with a further $14,000 remaining to allocate. Because of the Contact Energy Renal Endowment Fund the last two winters have been a little easier to get through for Ruakaka renal patient Desiree Goldsmith thanks to a $1,000 grant she received from the Contact Energy Renal Fund that helps pay hefty power bills to keep her lifesaving dialysis machine running. Desiree has Alport Syndrome which is a disease that damages the tiny blood vessels in her kidneys. She was first diagnosed in 2001 and had eight months of dialysis before her mother donated one of her kidneys for her to have a transplant. Since then, her kidney function has reduced to 20 percent, she has lost part of her eyesight and hearing and is now unable to work because she has no immune system. Because of her situation, social workers at Northland DHB put Desiree forward to receive a payment from the Contact Energy Renal Fund. All Desiree needed to do was to decide what would be the best way to use the money to help her remain independent. She already had a lazy boy chair to dialyse in, so decided to put the money towards her power costs. Desiree tries to keep her costs down by turning off switches around the house and has been contributing some her own money towards her monthly power bill since she first got the fund in 2016 to make the money last as long as possible. You can gift directly to the Health Fund PLUS – Rural Workforce Fund so your gift can be used now by the service and you receive a 33% tax credit. Visit our donate page here https://northlandcommunityfoundation.org.nz/donate/ to donate by credit card or through your bank account. You will need to choose Health Fund PLUS and then write ‘Rural Workforce Fund’ in the comments. Or we can invest your gift and deliver the interest from these funds back to Health Fund PLUS – Rural Workforce Fund every year, forever! Six founding trustees have been involved in setting up the Fund and they are all passionate about this very special part of Northland and want to see it thrive now and in the future. The Waipu Endowment Fund Trust represents donations from individuals, organisations and businesses in the Waipu district who want to contribute towards a permanent legacy for the long term benefit of Waipu. Anyone can contribute. Donations, gifts, bequests and endowments of all sizes are encouraged and welcomed. Waipu-based Trustees will advise on grants. Your contribution will be pooled with others, increasing its effectiveness. The more quickly funds grow the faster WEFT will be able to make funding available. You can gift directly to the Waipu Endowment Fund so your gift can be used now and you receive a 33% tax credit. Visit our donate page here https://northlandcommunityfoundation.org.nz/donate/ to donate by credit card or through your bank account. You will need to choose the ‘Waipu Endowment Fund’ in the fund options. Or we can invest your gift with Craigs Investment Partners and deliver the interest from these funds back to the Waipu Endowment Fund every year, forever! You can donate to the Northland Community Foundation via cheque, direct bank transfer or credit card.